SMITHVILLE, Mo. — Four area wrestlers secured a spot in the history books on Saturday, Feb. 2. Two wrestlers from Platte County and one each from Park Hill South and North Platte, via Mid-Buchanan, advanced to the first-ever MSHSAA Girls Wrestling Championships after placing in the top three at the Class 1 District 4 meet at Smithville High School. Platte County will be represented by Avery Krahenbill and KayLyn Munn at state, with both entering with wins in the third-place matches. Unlike the boys districts, only the top three wrestlers go to state instead of the top four. Platte County’s KayLyn Munn, left, won the third-place match in the Class 1 District 4 tournament on Saturday, Feb. 2 at Smithville. Going into the place matches, only Park Hill South’s Finley Bickford and Mid-Buchanan’s Haley Sampson had punched a ticket to state. That meant the Pirates grapplers had to win and both delivered. Krahenbill faced St. Joseph Benton’s Lexi Peterson for the second time in the tournament and got a late reversal to take a 3-0 lead and held on for the win in the third-place match. Now 15-6 on the season, all five of her matches were determined by close decisions. She beat Smithville’s Kaitlyn Case (7-6), Benton’s Peterson (2-0) and Maysville’s Zoie Sears (2-0). Park Hill South’s Finley Bickford, front, tries to escape the grasp of Fort Osage’s Tess Kinne during the 136-pound championship match at the Class 1 District 4 meet on Saturday, Feb. 2 at Smithville High School. Bickford took second in the match and will be representing her school at the MSHSAA state championships starting on Feb. 14. Krahenbill has been wrestling for five years and got into it after being told she couldn’t play football. She then got into wrestling and was hooked. Munn lost her opening match to Lafayette County’s Trinity Weaver but then won four in a row to reach state. 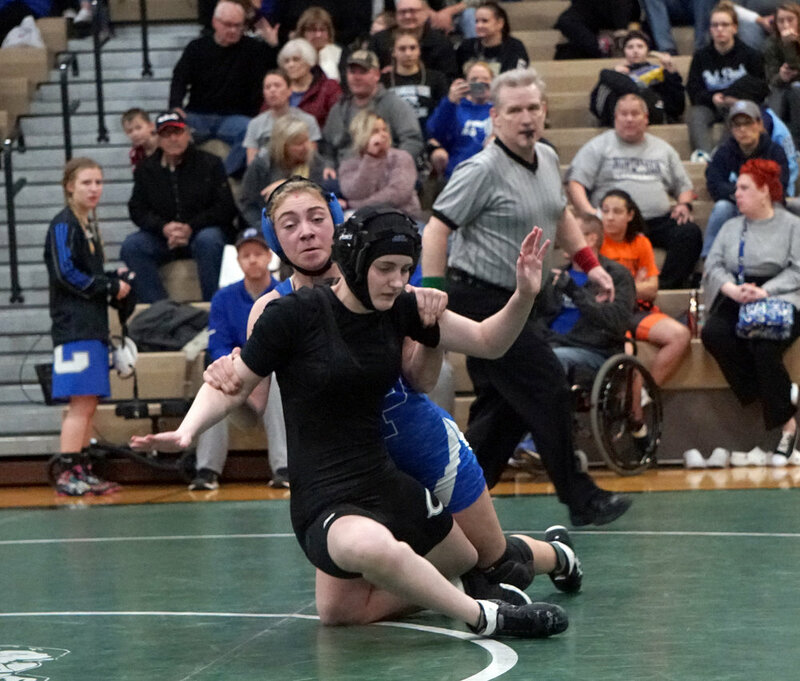 A 1-0 decision over Liz Garrison of Excelsior Springs kept the season alive and then Munn pinned Staley’s Anna O’Neill and then pinned Weaver in a rematch. In the third-place match, Munn needed 56 seconds to pin Lawson’s Patricia Baker to earn a spot in Columbia. Sampson and Bickford both the finals and finished as runners-up. Bickford went 4-1 for the Panthers and fell by a 5-4 decision to Fort Osage’s Tess Kinne, who improved to 23-0 with the win. Bickford tied the match at 2-2 early in the second period, but trailed 4-3 going into the final period. To reach the finals, Bickford (15-7) posted a 13-5 major decision against Plattsburg’s Amelia Schneider. Bickford added two wins by pins on Friday, Feb. 1, beating Chillicothe’s Summer Drake and Kearney’s Sam Kister. Sampson, the only girl wrestler on Mid-Buchanan, became the school’s first qualifier. The North Platte student admits it is unique to go to a different school and wear different colors to wrestle, but she is happy to be the first qualifier. “It was kind of my goal to go to state, that was my main goal,” said Sampson, who is now 10-3 on the season. She pinned Staley’s Lucy Saladino, then won an 11-0 major decision against Marceline’s Rachel Cupp in the quartefinals. In the semifinals, Sampson topped Krahenbill, 3-0. In the championship match, Sampson was pinned by Lawson’s Brooke Cox in 2:52. West Platte’s Mikenna Peters, back, takes down Cameron’s Hannah Husch during a match on Saturday, Feb. 2 at the Class 1 District 4 meet in Smithville. Peters lost in the third round of the consolation bracket. Platte County’s Sarina Bertram, Park Hill South’s Mystique Anderson and West Platte’s Grace Stevens, Lara Lieske and Mikenna Peters also took part in the district tournament. Bertram went 3-2 and had the closest call to making state, coming two wins shy. She lost in the quarterfinals to Liberty North’s Emma Williams, 5-1, but Bertram then beat Oak Park’s Lily Martin and then Smithville’s Jozie Kammler by pins. In the consolation semifinals, she lost by pin to Polo’s Abigail Bolling. A win there would’ve sent her to the third-place match.